Public roller skating for all ages. Live DJ playing great skating music. Birthday parties and more fun than you can have with family and friends. Admission is $9 per person and skate rental is $5 if needed. Non skating parents are free with their child. Join us for cheap skate Wednesday! Bring the whole family for a fun time for only $7 per person including skate rental. Great for all ages, our DJ is ready to play great skating music! It’s a great idea for a family fun outing. Skate to the music of the 80’s and 90’s! Some of the best skating music ever! Adults 18+ are welcome. Admission is $7 including skate rental! Friday night is FUN night at Sk8 World Portage Indiana. Have your Birthday Party on this session, our packages are affordable and include all you need to celebrate your special day. Ask at the office for details. Admission to skate is $9 per person and skate rental is $5. Non skating parents are free with their child. Enjoy our wonderful DJ playing all your favorites. Public roller skating for all ages! 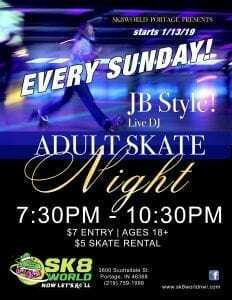 Come when you wish and stay as long as you like for $9 Admission and $5 skate rental if needed. Have your Birthday Party on this session! Our packages are affordable and provide everything you need for a special celebration with family and friends. Non skating parents are free with their child.